Have you been actively trying to conceive for the past 12 months or more to no avail? If you answered yes, then welcome to infertility. It's a journey like no other. It's one you never wanted to embark on, and it's definitely one you don't want to stay on for very long. But since you're here, let this book be your traveling companion! 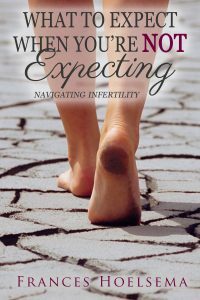 In What to Expect When You're NOT Expecting: Navigating Infertility, Frances Hoelsema uses her own personal experiences, as well as those of many other women, to guide and inspire you on this ultra-frustrating, highly-emotional, and what feels like an extremely-lonely journey. If you've got questions...there are answers! If you need tips...plenty are provided! If you need someone to understand...these women do! If you're feeling alone...be assured you're not! Whether you've just begun your infertility journey, or have been on it for quite some time, there is something for everyone. From astounding statistics, to real-life examples, to concrete sources of hope, this is one book you won't want to be without. So sit tight and buckle up! The journey will be bumpy, but with What to Expect When You're NOT Expecting: Navigating Infertility by your side, you've got this! As a matter of legality, please know that this book is not intended to diagnose, treat, or cure any part of infertility or any other disease that you may be experiencing. This book is in no way meant to substitute consulting with your physician. Please also know that you will not find any special diets and get-pregnant-quick tricks because these things simply don’t exist, and there won’t be any pointing fingers or commands on what to do or not to do because, as part of an infertility community, those things are not in our genetic makeup. What will you find? You will find useful information regarding infertility, whether a new or seasoned traveler, that will help you navigate your own journey. There are plenty of statistics, tips, real-life examples, and more that not only validate the things you’re going through, but that can be used for inspiration while you cope. I, Frances Hoelsema, as well as the many other women that contributed to this content, want nothing more than for you to find comfort in knowing you’re not crazy, you’re not alone, and there is always hope. Also, as a side note, please know that this book will contain some religious references, including multiple Bible verses. If this is not your type of thing, please feel free to bypass those sections, or perhaps pass on this book all together. I, in no way, want to offend anyone so please proceed in the way that best suits your comfortability.